Jewish law forbids a Jew from laying his hands on anyone in anger; therefore the condemned are killed by stoning. A completely pharisaical solution! Legal hair-splitting by Veliar, hell's own attorney! It's not people who kill people, but stones! The stones fly over the Earth and through the ages. Their trajectories are so long that it's hard to determine who cast them, who dealt the fatal blow. In the spring of 1924 Röhm carried out an unprecedented action. His detachment swiftly crossed the Swiss border and headed towards Dornach. There his storm troopers burned down the Götheanum. It belonged to the European Anthroposophical Society, an offshoot of Blavatsky's theosophists. In the process certain mysterious archives were destroyed. They belonged to Rudolf Steiner. Steiner was more than just a researcher of Göthe's work. He enjoyed fame as Europe's leading mystic. He was consulted on matters of the occult by many of the world's most powerful. Like the German field marshal Moltke, for example. Steiner's list of students kept growing and growing. The doctrines of anthroposophy appealed to the perplexed and disappointed, especially the possibility of "saving" the soul by means of defined occult methods. Both theosophy and anthroposophy are tolerant of various theological systems. The notion of reincarnation, in particular, was in vogue among the Steinerites (1). Black magic seeks dominion over the world through knowledge and control of mystical forces. I‘ve never observed freedom of spirit in those involved in the occult. They don‘t possess occult forces – occult forces possess them. Few impressed me as being so grace-deprived as Steiner. Not a single ray of light from above. He wanted to attain everything from below, to break into the spiritual realm by all-consuming effort. According to the predictions of anthroposophy's founder the Götheanum was to have stood for three centuries; in reality it lasted only a few years. Soon after the attack Steiner died. But why had he aroused such fury in Röhm's storm troopers? Strange, and all the more so because among his followers were many of those who would later occupy very high positions indeed in the Third Reich. Walther Darré, for example. On the SS hierarchy list for 1936 he's in seventh position. Darré was known in the Reich as one of the authors of the crucially important idea of blood and soil. The choice between blood and soil is the key choice in the creation of any state. Either it will be formed around the element of blood, on the principle of ethnic exclusivity, and then the chosen nation lives among enemies; or the principle of common soil will predominate, the unity of interests of all nations living on a given territory, on one land which they must defend together. Hitler chose the first option. The Reich was doomed. Great empires -- Rome, Byzantium, the Russian Empire -- were never built on the blood principle. Nor, in the Christian era, were they built on the soil principle. Spirit, that's what united them! In the meanwhile, pan-Germans, pan-Slavists and pan-Turkists praised and continue to praise blood to the exclusion of all else. In this fashion conflicts are inevitable, conflicts from which a certain third force always emerges the victor. For this reason the third force simply needs noisy hurrah-patriots of all nationalities (3)..
And now we'll turn to "Brother Marchion" (Christian Boucher). In keeping with secret society tradition he's initiated into several organizations, among them Golden Dawn and the Order of the Eastern Templars. Currently Brother Marchion is a Grand Master of the last-mentioned order in France (4). How are we to explain such indulgence toward Darré, Wirt, Hilscher and others like them on the part of the tribunal? Maybe the judges considered their mystical conceptions to be ravings unworthy of serious attention, and decided not to confuse the mind of the public? Carl Jung wrote that man writes off the existence of the devil because he intuitively fears meeting him face-to-face. But I maintain a different point of view. More likely than not we're dealing with the hidden solidarity of the initiated. Here's the key to understanding why the tribunal was so lenient towards these theorists of mystical politics. Revolution devours its own children, but not its fathers. Many of the accused were Steiner's students, and Darré was in addition an initiate in the hierarchy of Egyptian Rite Masonry known as Memphis Mizraim. What's more, he was a leading member of the Eastern Templars and "Golden Dawn". In front of me is an SS map. Europe is broken up into national provinces. The SS was regarded by some ideologues as a supranational order, along the lines of the Templars. These ideas, which were in opposition to Hitler's policies, made up the core of a document known as the SS Charter. It was signed by Himmler himself, future leader of Eurasia according to the charter's designs. Hitler, burdened by narrow national prejudices, was to inherit the lesser role of pan-German Führer." Among the principles of the SS Charter were rights of the individual and ethnic group, division of labor in Europe and freedom of religion. The term "United States of Europe" was employed. Moscow is the Third Rome and the Fourth will not be! Third, in relation to Rome and Constantinople. Third in the sense of spiritual succession. Hitler's Reich was also the Third. Third after the Hohenstaufens and Chancellor Bismarck. Thus was designated a crude pan-German succession. This was the conception that won in the end, though the SS opposition had a different plan, one which might be conditionally called interfascism. The idea was to create a sort of neo-Templar brown international, or more aptly, taking the occult interests of the SS into account, infernational. Ancient Wewelsburg Castle became the meeting place for high initiates of the SS. It forms one point of a mystical Bermuda Triangle. Another of the triangle's points is the Cliff of Externstein, site of an ancient German temple to the fire cult. Here was an observatory of sorts, through which high priests of old watched the eternal motions of heavenly bodies. The third point of the triangle is the Teutoburg Forest. According to legend the Germanic warrior Arminius routed three Roman Legions among its oaks. Here German mysticism and German military glory merge into one. Wewelsburg was to be the center of the SS's multi-national empire. And in Wewelsburg the thirteen highest initiates of the black order would meet at a round table, just like the knights of King Arthur. A plinth for the Holy Grail was even prepared. It was not fated to be occupied, just as the SS were not fated to achieve world dominion. May 1941. Rudolf Hess lifted off in his personal Messerchmitt 110 from the factory aerodrome. Thus began one of the most enigmatic flights of the Twentieth Century. A map with Hess' own markings remains to this day. They show that a roundabout course was taken. Finally the plane is above the south of Scotland. After a parachute jump the high-placed emissary touches down not far from the estate of Dungwell Castle, owned by Lord Hamilton. Hamilton had been recommended to Hess as a contact by Professor Haushofer's son Albrecht. There's a theory that Hitler's and Hess' guru Haushofer had prepared this mission to offer a colossal deal to the English. It involved the dividing of spheres of interest between Germany and Britain. With only two weeks remaining to the invasion of Russia, Hess was supposed to reassure the English. Hess' personal secretary later confirmed that Hitler knew about the mission. However he immediately declared his right-hand man in the party to be insane, and the English eagerly supported Hitler's verdict. Later the Nuremberg Tribunal was to do so as well. Thanks to the psychiatric diagnosis Hess received a life sentence [instead of execution], which ended in a suspicious death. So what we seem to have was an offer to prolong the Munich Agreement, which the English nobly (!) refused. But why, then, did they classify all documents relating to the mission of the "insane" Nazi? They remain classified to this day. And indeed, is a plot between England and Germany in keeping with Haushofer's style? You see, the professor had always urged a union of the continental powers against England and the USA! Hess was initiated into a secret society; I can only say that he flew to England to meet with other initiates, but he was prevented from doing so. The Germanenorden and the related Thule Society (into which Hitler was initiated) were founded by Baron Sebottendorf, a Mason of the "Memphis Mizraim" lodge. So the Nazis used the experience of Masonry. Inasmuch as hundreds of pagan cults and religions had brought their offerings to its altar, many dark tones of ancient mysticism mixed in with the brown of fascism. On March 1, 1942 Hitler issued an order: make a wider search of all materials in Masonic archives which might be of interest to the Reich. So the Nazis strove to extract specific knowledge from Masonry, and then ... get rid of it. If that's the case, then might Steiner and Sebottendorf, who both died mysteriously, have been lodge members? And was Hess' visit organized by still-surviving Masonic contacts? The inventiveness of the creators of horror novels is striking. That impression passes quickly, however, as soon as you've realized that the authors of the most "true to life" novels are usually members of extremely dubious secret societies. You begin to notice the curious hints that appear among the adventures of their vampires. "Golden Dawn". In front of me is a contemporary publication of that organization with a description of its rituals. In the center of the cover is the mystical symbol of the end of time, the tau. It's ornamented with interweaved pentagrams, roses and crosses. Yes, this is one more offshoot of the Rosicrucians. At the beginning of the 20th Century in England the Order consisted of 144 initiates (a diabolical hint on the number of saved righteous men in the Book of Revelation). The road to heaven lies through hell. The tablets from Mount Sinai are no longer in force. Conscience is a Jewish invention, like circumcision: a truncation of the human essence. A new epoch is dawning: the epoch of magical interpretation of the world by means of will instead of knowledge. There is no truth, neither in the moral, nor in the scientific sense. That's just one small quote from the "Book of Laws" (7). Crowley's works were passed on to Hitler by Marta Künzl, who was both a well-known National-Socialist and a member of the Order of the Eastern Templars. Leon Trotsky, (Leib Davidovich Bronstein) was the factual head of Russia after the revolution. The main organizer of the revolutionary terror which took the lives of millions of Russians. Introduced the five-pointed star and other Masonic symbols into the Bolshevik government. 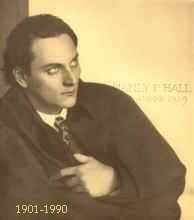 Fred Zeller, Trotsky's personal secretary, was Grand Master of the French "Grand Orient" lodge (1971-1973). Crowley tried to influence many politicians. He met with Trotsky and Mussolini, who, by the way, was a member of the Masonic lodge "Piazza di Gesu". It's known that Crowley also sent his book to Lenin. Some say it was he who taught Churchill his famous two-finger "victory" salute. In the language of the occult this gesture signifies Satan. This, by the way, is also mentioned in contemporary materials published by "Golden Dawn". 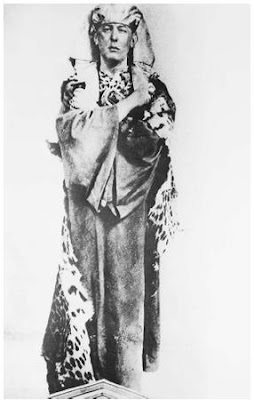 Photographs exist showing Crowley dressed as an Egyptian mage. On one of them he holds his finger to his lips: the gesture of Harpocrates. On another he presses his left hand to his heart. This signifies the magic power of the left hand, satanic in nature. The theme of Ancient Egypt is a constant presence in the verses and magical and philosophical texts of "Master Therion". The discoveries of Egyptologists and the decipherings of mystical writings found in the Nile Valley inspired many mystics, from Blavatsky to Papus. In their opinion the finds of archaeologists successfully complemented Cabbalistic teachings, drawn long ago from that very same Egypt, the country which the Jews call "Mizraim". Archaeology and its related disciplines are truly mystical in nature. Digging up that which has been long hidden - and often providentially so -leads to just what consequences? To consequences which the rational mind can't even imagine. It's enough to read the name of a dead god inscribed on stone - for it to come to life. To discover a sacrificial altar - for it to once again demand blood. To whisper a just-deciphered incantation - for it to begin emitting faint, at first barely perceptible currents. But sooner or later a human antenna will be found to receive the frightful messages of ancient man. Let's open up Manley Hall's Masonic Encyclopedia. It illustrates clearly the scale of secret societies' influence on art and literature. Their symbols and rituals inspired the artistic imaginations of many. Reworking mystical legends, writers and musicians often used their subjects in their works, reawakening forgotten ghosts in the mass-consciousness. Such mystical pluralism reminds us of the vision of St. Makarios the Egyptian. Once a devil with many pots hanging from him appeared to the saint. "What are all those pots for?” he asked. The devil answered: "I'm carrying food for the brothers. If someone doesn't like one thing, I offer him another..."
Masonry is ready to lend you the idol of your choice. The founders of "Golden Dawn" preferred the gods of Ancient Egypt. Crowley visited Egypt, Tibet and other centers of dying civilizations. Before his death he explained the purpose of his mission: to set into motion those occult forces which would reach their apogee at the end of the century. Do we have an attempt here of the above-named organizations to influence the minds of contemporaries through literature? Such spiritual expansionism could have been founded on the mystical notion that the word, once pronounced, is just the first phase of an idea's materialization. Later it will come to fruition on the social and political planes. The litterateur who blasphemously conceives of Divine creation as chaos, who picks out only those hues and sounds which he needs from the multitudinous variety of the world, is attempting a very risky role. The role of demiurge. And he who pieces together the most effective associations to create the most convincing picture of reality, in bead game fashion, is a most dangerous practitioner of the occult magic of the word. Soon error is foisted on the masses and begins to control them. To move them ... towards the abyss. The demons can rest easy. Fallen man, endowed with talent, does the devil's work far better than the horned and tailed functionaries of hell. But let's return to Hess. "Golden Dawn" was traditionally strong in England and Germany. We've seen that it was connected with the Thule Society. We might assume, then, that Hess set off for England to seek just these contacts. But with what end in mind? At the 1936 Berlin Olympics many friendships were formed, one of them between Hess and the Duke of Windsor, known for his Nazi sympathies. He'd been excommunicated from the British throne by King Edward VIII. (The reason was his marriage to a twice-divorced American woman.) There's no question that the duke dreamed of revanche. There were common interests between him and the Germans, then. In Abwehr leader Walter Schellenberg's reminiscences there's a curious episode. We're speaking of Hitler's order to abduct the Duke of Windsor in Portugal. The plan was foiled by British intelligence. The former king was returned to his homeland where he lived quietly up until the 70's. Was Hess' flight just one more unsuccessful attempt to play the "Duke of Windsor" card, using Masonic channels? There's one fact of no little importance: According to tradition English Masonry is headed by a member of the royal family, and the duke was Grand Master of the British lodges. So Hess' mission failed. According to our theory he was betrayed by the "Golden Dawn" -Thule - English Masonry connection. Before that the members of Memphis Mizraim had suffered defeat in their attempt to find a key to the Nazi leaders. The psychological attacks of the Eastern Templars also came up short. Steiner's Götheanum was burned to the ground. Crowley, who for a long time had enjoyed the sympathy of Mussolini's regime, was thrown out of Italy. (Crowley saw in fascism an instrument for the creation of the mystical equinox storm, an upheaval capable of jolting humanity into a new epoch, a new zone(8)). It's well-known that before the founding of the Order of Thule he [Sebottendorf] was a member of Memphis Mizraim in Turkey. The Turkish branch of that organization is known as "den me": werewolves (http://www.donmeh-west.com/). This is an organization of people only outwardly recognizing Islam. Ataturk and the whole revolutionary organization of that country are its creation. Ataturk and his fellow revolutionaries were all Masons, and to this day Turkey remains the main Masonic bastion and US ally in the Middle East, second only to Israel. After the "Young Turks'" rise to power the Constantinople Patriarchate of the Orthodox Church fell under Masonic control as well. Today's Patriarch of Constantinople, Bartholomew, is a great promoter of "ecumenism", the Masonic/globalist project for the unification of the world's religions. So it turns out that even in the framework of the Germanenorden and its affiliated Thule Society Baron Sebottendorf was acting as an emissary of Egyptian Masonry! If that's the case, then the suspicions of the Nazi leadership as to who stood behind these structures were not unfounded! Almost all modern occult movements emerged from the Cabbalists. Isaac Luria's school of the Cabbala was the moving force behind both Sabbataism and Frank's movement. They were called the "Enlightened Brothers of the East". It was just these lodges which were to later give rise to "Golden Dawn" and the tendencies of Aleister Crowley. (10). Yes, Memphis Mizraim stands revealed as a sinister, secretive and omnipresent organization. Evidently it intended to revive not only the witchcraft, but also the social practices of Ancient Egypt. Real power in that country, you see, more often than not belonged not to the Pharaoh but to the Alom, a council of priests. The dark superstitions which they imposed on the disoriented masses allowed the "chosen" to rule the country for centuries. This theory is supported by a document recently published by the Council of Europe. It's called "Medicine and Human Rights" and contains a report by the former Grand Master of the French "Grand Orient" lodge Roger Leray. Here's one significant passage from the report: "A fear which can overcome millions is the result of abstract, perhaps unworthy, but clearly esoteric constructs." "Those wise guys think that our goal is merely to calm the masses, keep them in a state of dull apathy... No! Only when they're aroused by my fantasies do they become governable!" But how do we explain the failure of contemporary followers of "Egyptian" practice? Did another force get the upper hand? There exist two main branches of Masonry in the world. One of them, Memphis Mizraim, is revolutionary. It aims to change the world, in whatever condition it may be. The other branch, regular Masonry, which includes the Scottish Rite, is concerned with the organization and governing of the world. The "Scots" strive to place their members at the center of the governing system. Memphis Mizraim was always in contact with revolutionary movements: with Garibaldi, Trotsky, Italian Fascists, the Red Brigades. It's characteristic that Crowley was a member of both Memphis Mizraim and the Irish Republican Army. Some specialists believe that mystical conceptions lie at the basis of their revolutionariness. The main idea is that the world can live only in struggle, in constant upheaval, known in the language of the occult as the "equinox storm".